Liu Yang outside his shop in Huilongguan in North Beijing. Liu Yang outside his shop with two of his three assistants. A selection of cheese nicely made in China. 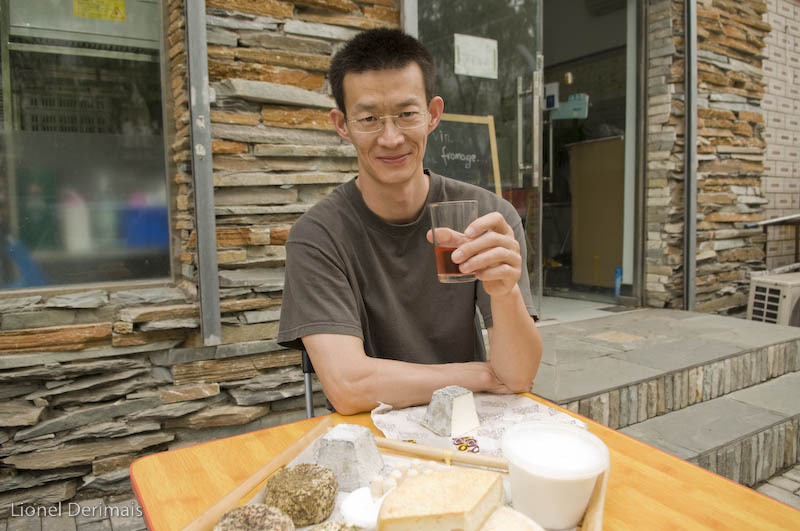 Liu Yang with a selection of his cheese. From the left: Liu Yang, Wu Yi, Xu Jiang Yo and Huang Zhi Wei in the Huilongguan shop. 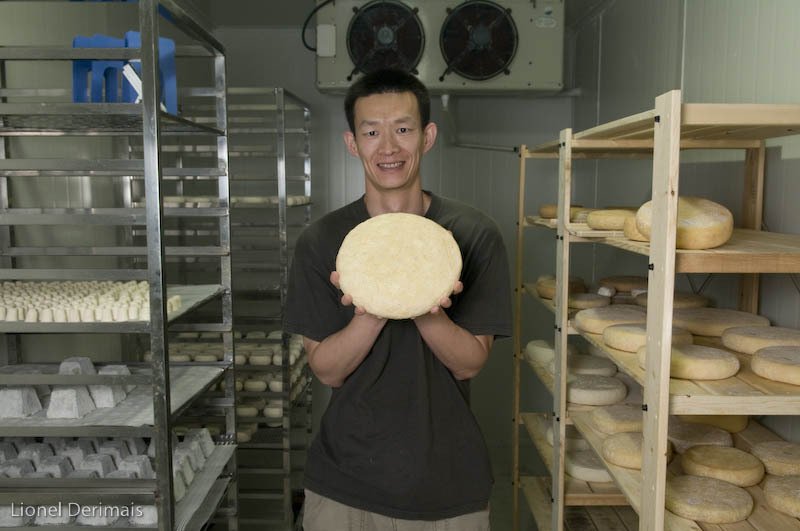 Liu Yang with a tomme in the maturing room. At Nicely Made in China we like to eat and what better way to end a good meal but with some cheese! But as it turns out it’s not easy to find good cheese in Beijing at decent prices. 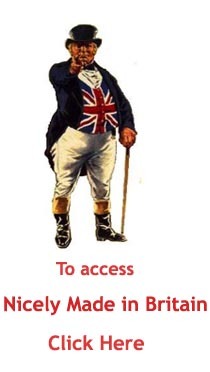 If that was one of your problems, NMiC found the man who can help. 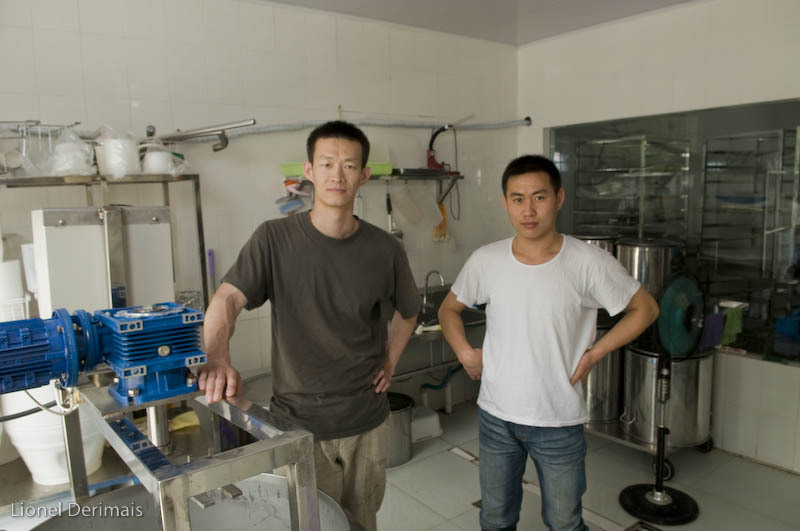 Liu Yang, a Heilongjiang native, makes cheese. All sorts of cheese. In an interview conducted “dans la langue de Voltaire” he gives NMiC readers a crash course in cheese making. 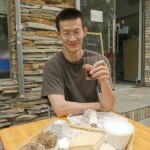 Liu Yang, few people would imagine finding a “fromagerie artisanale” in North Beijing. Can you tell your story for Nicely Made in China readers? I discovered cheese in France while studying management at the university of Auvergne in Clermont-Ferrand in the Massif Central in 2001. To greet the 50 newly arrived Chinese students the university had organized a buffet. I remember there were a lot of different cheese that day: pâtes dures, pâtes molles, blue vein etc… I don’t remember the names of all the cheese that we had that day but I remember trying them all. That’s how my love story with cheese began. Later I moved to Corsica near Corte for two years to finish my studies and at the same time I enrolled in a program to learn how to make cheese for 4 months with the Cesari brothers, local famous cheese makers. When did you start making your own cheese? I’d been back in China for a few months and in November of 2007 I decided to make and sell cheese. I first tried in my kitchen and at the end of 2008 I organized a degustation at the French Cultural Center and another one at Little Saïgon. A few months later – mid 2009 – I opened that shop in Hui Long Guan district. What kind of cheese are you making in your laboratory? Today we sell a cheese I call the “Gris de Pékin” which is between camembert and St Marcellin. I’d like to do camembert but I just cannot find the same milk that you find in Normandy to make the perfect camembert. Also the molds I am using are slightly smaller than the ones that are used for making camembert and have more holes in it which changes the texture and the taste. For that cheese, the “Gris de Pékin” we use pasteurized milk heated at 72 degrees and sometime unpasteurised milk. We coat our cheese in either garden herbs or Provence herbs. We also make Valençay pyramid [in French]. For that cheese I use cow milk and goat rennet which gives a little goat cheese touch. 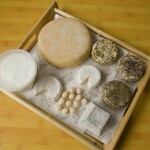 Tomme is another cheese we produce as well as the Corsican brocciu which I make using cow milk [instead of ewe milk]. I also make faisselle [in French] and crème fraîche. Where do you find your milk? I buy milk from the American company Wondermilk. They have a farm with 6,000 cows North of Beijing. Can you tell us who are your clients here in Beijing? Most of my clients are expatriates but a few Chinese are now coming to the shop. They usually buy for their children. For them I make mini-crottins that they love. Where can NMiC readers buy your products? 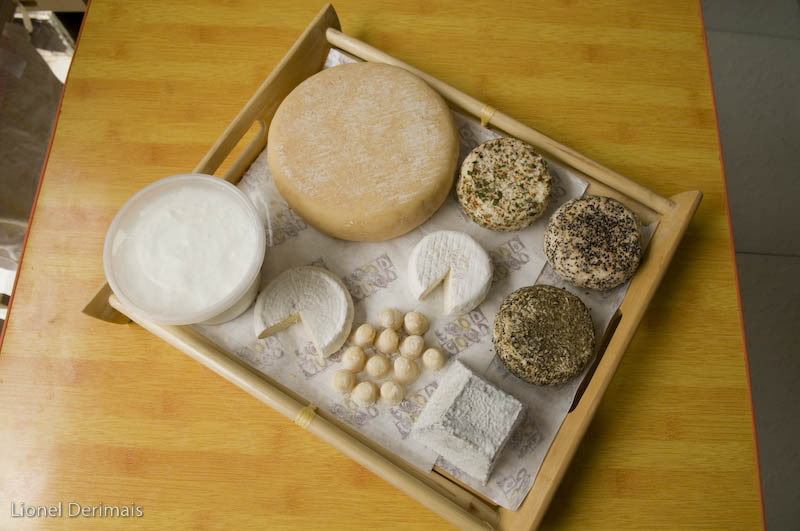 Our cheese is also served at those restaurants around town: The Olive on Dongzhimen, Maison Boulud in the legation quarter, La Mansarde on Lucky street, The Orchard in He Ge Zhuang and at Hotel G on Gongti Xilu. How much cost your cheese? A “Petit Gris” costs 25 yuan, a pot of 500g of faisselle 35 yuan and the “Gris aux herbes de Provence” costs 55 yuan. A pyramid is 45 yuan. Is there anything your clients should be looking forward to for the future? Lots of people love goat cheese so I am going to buy 10 goats and will start making goat cheese in September. Business Hours: 9h00-12h00, 14h00-18h00 every day. The cheese of Liu Yang are fantastic ! You must try it ! !